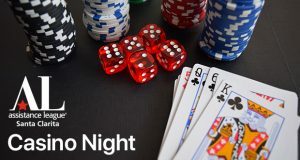 Assistance League of Santa Clarita organizers revealed a new development about the organization during its first ever Casino Night Fundraiser at Valencia Hyatt Regency Hotel on Friday evening. With over 250 guests in attendance, Assistance League Santa Clarita officials announced that the nonprofit would be buying a new property along Bouquet Canyon Road in Valencia for its businesses to run out of. “Tonight was very special for us because we revealed after 30 years of saving our pennies, we bought a building.” said Gale April Nolet, Vice President of Resource Development and chairman of the event. For years, Assistance League Santa Clarita officials have been looking for a new home for their thrift store, which benefits local families in need, officials said. The current property, Assistance League Resale, which is located on Main Street in Newhall, is not owned by the organization according to officials. Organizers also revealed drawings of the new building that show what the building will look like once renovations and construction is complete. The casino night event consisted of casino type card games, dinner, and a raffle. All proceeds from the event are set to go towards Assistance League Santa Clarita philanthropic programs, Vice President of Resource Development and chairman of the event, Gale April Nolet said. To find out more about Assistance League Santa Clarita, click here.